A man of true style shows his taste level in everything he does. For the man of present generation silver jewellery is quite a craze. Stylish men with silver earrings are sure to grab the attention of women. 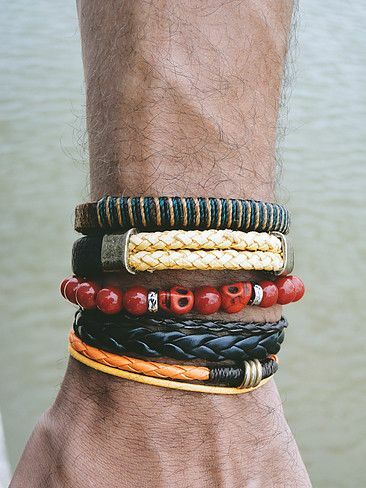 But men’s jewellery is not limited to earrings or rings only; there are subtle and intricate bracelets and necklaces that men love to have in their possession. It’s nice to see people getting away from just the watch and ring. It is the designs of jewellery that make an impressive, bold and fashionable statement.The options for jewellery for men today are many, the sleek designs in alternative metals and everything from tungsten carbide to titanium to stainless steel, rubber, cable, diamonds as well as silver and gold all are used to create exquisite pieces of jewellery that can give a different but fashion forward and sophisticated look to men. Cufflinks, watches, bracelets, necklaces and pendants in contemporary metals are quite favoured choices for women when it is for gifting something to their dear men. When jewellery pieces are concerned the popular choice is stainless steel; the reasons are it is strong, durable and resistant to scratches. Since the look of this metal does not change and it is quite affordable too, you can wear it on a daily basis and even while travelling or playing sports too. It is equally good for formal events too. Rings, bracelets, chains and pendants in stainless steel are quite strong and there is no risk of breakage. Also Read – What’s on your wrist? Tungsten which has a rich oxidized look is quite a favourite as jewellery item for men. It is extremely hard and scratch resistant; it comes with the similar characteristics of titanium. Titanium is strong and durable and has a “cool” look and feel. With the help of new process called anodizing, you can get it in black and various other colours today. The sleek, trendy, stylish and elegant pieces of jewelleries in exclusive designs are available at affordable prices. So go change your look and you’ll have faces turning on the road! Make sure you share the page on whatsapp with just one click! Good luck! 4 Types Of Cufflinks You Should Have Known Yesterday!